Organizers of a newsroom union at the Chicago Tribune have given the Tribune's parent company, Tronc, a day to voluntarily recognize the guild and start to negotiate a contract. According to a letter from the Chicago Tribune Guild organizing committee obtained by NPR, the nascent union has received signed union authorization cards from more than 85 percent of staffers who would fall under the bargaining unit. "Voluntary recognition would allow us to begin contract negotiations, saving the company the cost and inconvenience of a campaign and an election that will result overwhelmingly in our favor," read the letter, sent Tuesday morning to Bruce Dold, the Tribune's editor and publisher. This story will be updated with any reaction from the Tribune and Tronc. It is quite a turnaround in fortunes for unions at Tronc, which comes from a strong anti-union background. Historically, the Tribune and its corporate owners took a strong stance against unions at the paper and in society more broadly. More recently, Tronc fought fiercely for months against unionizing efforts at the Tribune's larger sister paper, the Los Angeles Times, yet lost badly in a lopsided vote held in January. Tronc, then controlled by Chicago investor Michael Ferro, announced it would sell the Times and The San Diego Union-Tribune less than three weeks later. That sale, to Southern California billionaire Patrick Soon-Shiong, is expected to go through in coming weeks. Ferro is now gone from the company. He sold his controlling minority stake to McCormick Media — controlled primarily by Sargent M. McCormick-Collier, a relative of the legendary late Col. Robert McCormick who ran the Tribune and built it into a multiplatform staff. "If the company does not recognize the Chicago Tribune Guild, we will file the signature cards tomorrow with the National Labor Relations Board, and an election will be scheduled," the organizing committee wrote in a separate note to staffers. A Chicago Tribune spokeswoman said the paper was reviewing the guild's request. "We believe we can best build on the Chicago Tribune heritage and trust with readers by working together as an organization," she said in a emailed statement. "We will continue to work toward our common goal of ensuring that the Chicago Tribune is a leading source for news and information, whatever the outcome." 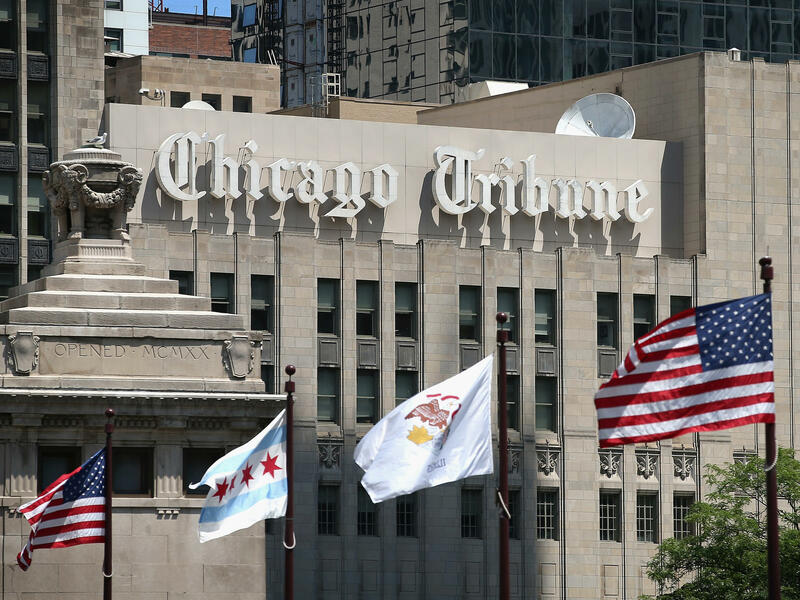 The Tribune's parent company, Tronc, and its corporate predecessor, Tribune, have suffered severe financial setbacks, some of them self-inflicted. That has, in turn, led to waves of layoffs, buyouts and cutbacks. The Chicago Tribune newsroom is perhaps a third as large as it was at its height. In the years since it was rechristened Tronc, the company has been beset by controversy and internal crises, starting with a frenetic branding effort around digital innovation. In Los Angeles, the Times' new publisher, Ross Levinsohn, was sidelined by questions raised over past workplace misconduct (He took a leave and became Tronc's chief executive over its digital activities). The LA Times' new editor-in-chief, Lewis D'Vorkin, sparked a newsroom mutiny over his conversations with Disney over coverage and with his accusations that his journalists have been disloyal. He was shifted over to the digital unit in February and left the company earlier this month. The company created an uproar with plans to create a large separate digital newsroom that would have generated a vast new output of online content outside the company's newspapers, including the Chicago Tribune, the LA Times, The Baltimore Sun, South Florida Sun-Sentinel and Hartford Courant. A senior Chicago Tribune editor, metro editor Mark Jacob, announced on April 5 that he was leaving the company and tweeted: "owners and managers of media companies must embrace a mission of journalism as public service, invest in their people and show bravery and independence. Our democracy depends on it." Some digital newsrooms and smaller newspapers have been seeking union representation as well. Union efforts recently have popped up at some surprising newsrooms — including the digital outlet Mic, the satiric publication The Onion, the Casper Star-Tribune in Wyoming and the Missoula Independent in Montana. If the union is recognized by Tronc voluntarily or wins it in a vote overseen by federal labor regulators, the guild would represent about 280 nonmanagement employees at the Tribune; its sister Spanish-language daily, Hoy; the entertainment-oriented tabloid RedEye; and four suburban publications. RACHEL MARTIN, BYLINE: Journalists at the Chicago Tribune say they're one step closer to unionizing. They voted overwhelmingly in favor of it and have given the paper's owners 24 hours to respond. It's a big turnaround for the paper, which has historically been nonunion and proud of it. NPR's David Folkenflik has been following this, and he joins us from our studios in New York. DAVID FOLKENFLIK, BYLINE: Hey, Rachel. MARTIN: So the Chicago Tribune is owned by Tronc, formerly known as Tribune Publishing. So how are the paper's owners going to respond to this? FOLKENFLIK: Well, so the labor organizers say that 85 percent of the journalists who would be in this bargaining unit have said that they've signed union authorization cards, and it means if they would go to a vote, it looks like they would win overwhelmingly. So right now Tronc is trying to figure this out. It appears as though they're hiring, I'm told, some fairly serious labor relations lawyers. And the question is whether they accede to reality or buy them some time, kick the can down the line and force the union to go to the National Labor Relations Board for a federally overseen vote, which it would appear that the newsroom union would win overwhelmingly. MARTIN: The paper might just do that. So why is this happening now? What's the motivation behind the union effort at this point? FOLKENFLIK: Well, there have been two waves of layoffs at the Chicago Tribune just in the past six, seven months. And that's followed years of financial instability. There was a bankruptcy and debt, waves of cuts and consolidation. I think the Tribune - this is very rough numbers - about a third as large as it was at its height, and they say they want to have job protection, and they say they want to ensure the quality of coverage over time to the people of greater Chicago. And that's why they're standing up and doing this. MARTIN: There was an early - or an earlier effort at forming a union at the Tribune's sister publication - right? - the LA Times. What ended up happening there? FOLKENFLIK: They won overwhelmingly, as well, after months of internal turmoil at the Times over the paper's publisher, the paper's editor in chief and plans to outsource a significant amount of digital jobs in a way that would have generated a ton of volume of content outside the control of places like LA, Chicago, Baltimore and their other newsrooms. Tronc was so appalled and fought that fiercely. Tronc sold the paper not - you know, less than three weeks after the fact. That sale is expected to go through in coming weeks. And the real question is what they're going to do now, you know? The chairman of Tronc, who is the controlling minority owner, effectively sold his shares after he was enmeshed in this sexual harassment scandal, but he got out of the company and sold his shares to a relative of the former owner of Tribune, the McCormick family. So there's a question as what they're going to do in response, how hard they're going to fight at this moment. MARTIN: All right, NPR media correspondent David Folkenflik reporting this morning from our studios in New York. David, thanks so much.